English Bridge Education & Development are the distributor for all your Bridge for All needs. We strongly encourage Bridge for All students to purchase their requirements through their teacher, which brings with it important benefits including free registration as an EBU member, a year’s subscription to English Bridge magazine, our 18-month bridge player’s diary and important discounts at The Bridge Warehouse. The following items can be ordered by phoning Lisa Miller on 01296-317217 between 8am and 4pm on weekdays. Outside these hours, please leave a message or e-mail us and we will phone you back. * - Please note that pdf copies of these courses are available for free download from the EBTA Teacher’s Zone, which is accessible via the EBU Members’ Area. EBTA members who are bona fide BfA teachers may request pdf copies of the Teachers Guides by email request to Lisa Miller. For details of our up-to-date prices and stock availability, please contact Lisa Miller. Postage rates vary depending on the weight of the order and whether First or Second Class mail is chosen. For larger quantities, we use an overnight courier service. Alternatively, items may be collected from our offices in Aylesbury by prior arrangement. If you are buying other items from the shop, please let us know and we will make every effort to save you money by combining postage and packing. The Bridge for All logo is the property of the EBU and may not be reproduced without permission. 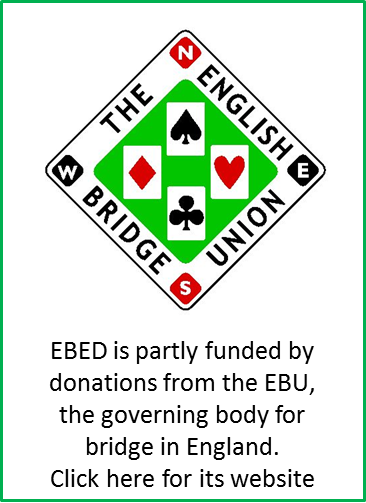 The EBU has given blanket permission for the logo to be used by EBTA teachers in good standing offering bona fide Bridge for All courses, using EBU copyrighted materials purchased from EBTA and strictly as is necessary for their promotion of such teaching. All Bridge for All materials are protected by copyright and may not be reproduced, stored in a retrieval system or transmitted in any form or by any means, electronic, mechanical, photocopying, recording or otherwise without the prior permission of the English Bridge Union. However, EBTA teachers in good standing who are using the Teacher’s Notes as part of the Bridge for All teaching scheme may reproduce such material as is necessary for their genuine teaching without the need o obtain further permission from the English Bridge Union.